Pilipino-Maharlika culture had been devastated since colonization centuries ago. We attained liberation from spain, Americans and Japanese 1945. But colonial mind and identity crisis exist in all of us. This cultural crisis left our country poor, corrupt, sick. I grew up in a Martial arts family and used my skills to survive in the streets of bicol and manila in the 60's. I left Philippines when I was 13 and became a yogic monk in India. I was teaching martial arts and yoga in 70's in USA and Canada. 1973 I visited my Yoga Master "baba" of Ananda Marga Society. Unfortunately, He and his students where put in jail for speaking against the government. I myself was detained for 9 months in Tihar jail during India Martial law. Without charges I was release and back to Philippines teaching. 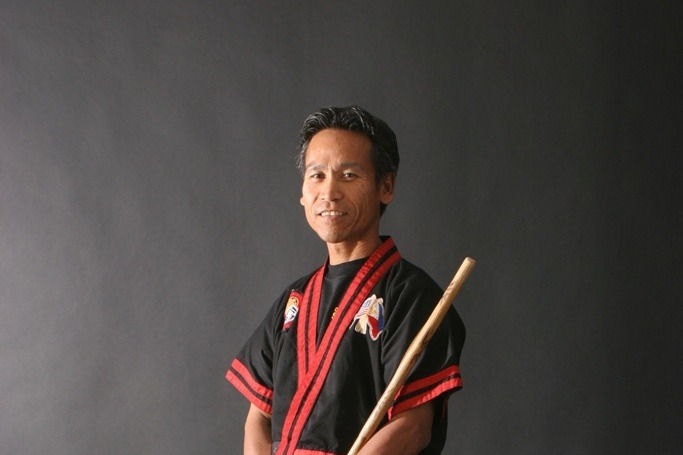 In my travel to Portland, I found Grandmaster Remy Presas who taught me Modern Arnis. Thru Arnis, I found my filipino identity Arnis, Kali, escrima is filipino martial arts culture.. Thru arnis culture I was able to get work as a trainer/teacher, film stunt work and now advocate of filipino culture. I was also able to learn golf, natural healing, filmaking Since 1980 i had been teaching arnis in Canada, USA, Brazil. In 1992 I won the role of "Michaelangelo" martial artist in Teenage mutant ninja turtles movie and TV series., 2003 I was working as mind body coach at David leadbetter golf academy had a chance to work with Pros. 2011 I found myself teaching back in Philippines and advocating Arnis law R.A. 9850. Arnis became National sports and martial arts of the Philippines since Dec. 11, 2009. but it had not been implemented to this day 2018. I started the FMA unity and travelled worldwide to give awareness. to Arnis Filipino culture. I believe it is our a great contribution to society for fitness, wellness, positive attitude, natural healing, confidence building, healthy lifestyle. Just like yoga of India, Karate, Aikido of Japan, Tai chi kung fu of china or tae kwon do of Korea. Golf of the west. Arnis sports martial arts of the Philippines. 2019 it is now included in SEAGames. I have the priviledge to teach at Zone golf academy in Richmond BC, and learning more. My vision is to teach more instructors and create arnisgolfyoga. My family has a property offered in Bristol, Virginia and our ancestral land in Camarines Norte. . In Richmond thru Zone Golf academy we offer sports education, In Marion Arnis Maharlika Institute we are building a Cultural center and in Camarines Norte, Inocalla farm we have mountain kids school built run by donation manage by yogic nuns of Ananda marga and we are building yearly Camp start Febuary 15, 2019 Maharlika training. Thou I charge for my training but we have several projects and students who cannot afford to pay. Every fees I collect goes back to help my family , my students and our Maharlika centers. I believe creating enlightened instructors and building healthy positive schools, clubs, centers in our community will help create a better world for all us.. Any of your financial support will only speed up our work. Thank You..